Closer view of a normal left tubal valve. Anterior wall (on right) is convex. Posterior wall (on left) is concave. In between, the dark vertical cleft (yellow arrow) is the Eustachian tube valve. In any malfunction of the tubal valve, we speak about Eustachian tube dysfunction. Several aetiologies may lead to this dysfunction. Any kind of inflammation of the inside tubal mucosa (reflux, allergy, infection, chronic rhino-sinusitis) provokes an oedema with excessive mucus secretion and leads to an obstructive dysfunction. Any kind of muscular malfunction (impairments, weakness, atrophy, coordination problem), secondary to damages of previous surgeries (adenoids, turbine, tubal or oncology), hereditary disorders (Cleft palate ...), post radiotherapy or general systemic amyotrophies, may induce an obstructive dysfunction or Patulous Eustachian Tube (PET). Edematous mucosa and hypertrophied cartilage at the posterior wall. The luminal curve is inverted, convex at the sick posterior wall. This is the target of the surgery. Etiology : reflux. 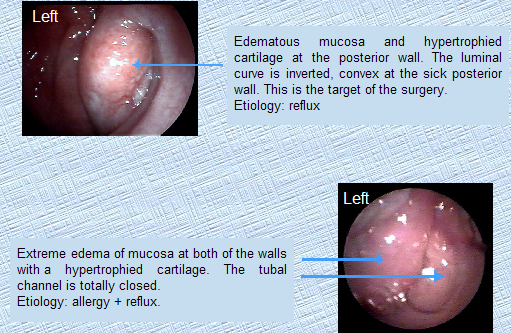 Extreme edema of mucosa at both of the walls with a hypertrophied cartilage. The tubal channel is totally closed. Etiology : allergy + reflux. Obstructive ET dysfunction results in reduction pressure in the middle ear. Patients can present with various complaints, including hearing loss, tinnitus, ear aches localized to the mastoid (just behind the ear) sounds distortion, fullness and dizziness. These symptoms may be intermittent, recurrent or progressive, and may lead to middle ear effusion and recurrent otitis media. Some ET dysfunctions are sub clinical (astride). The weak as the tubal function is (kept by a minimal reflux or allergy), it may be sufficient to keep enough ventilation of the middle ear if there is none of additional external inflammation. But in case of a simple cold, or in fast weather, or altitude changing as in airplane, driving in mountains or diving, as small as the inflammation or congestion is it may induce a real clinical ET dysfunction with all symptoms and pathologies. When can this problem happen ? Flying attendance and passengers, paragliding, diving. But sometimes, the limit of discomfort begins by travelling in mountains, and using the elevator. Some people need to break their descent with elevator in between, just to enable compensation. 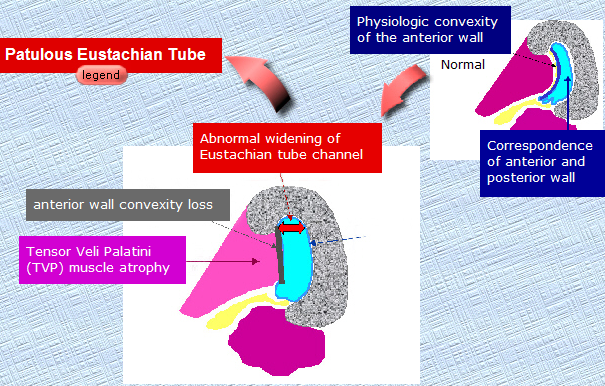 The Eustachian tube physiology chapter explain all details. The solutions chapter introduces the way to treat. 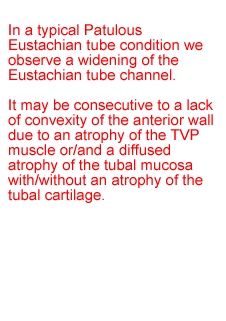 In a typical Patulous Eustachian Tube condition, we observe a widening of the Eustachian tube channel. It may be consecutive to a lack of convexity of the anterior wall due to an atrophy of TVP muscle or / and a diffused atrophy of the tubal mucosa with / without an atrophy of the tubal cartilage. Patulous Eustachian Tube (PET) or tube to open remains an ET dysfunction category, difficult to diagnose and to treat. Recent studies suggest that the pathophysiology and etiology of PET is more related to a previous history of otitis media, rather than from weight loss, which was widely recognized as the major causal factor. Simultaneous weight gain can even be observed in some cases. The average age is 30 years, with a female prevalence. It’s rare to find patients of less than 15 years of age, which seems to confirm the opinion that PET is an acquired condition. Chronic upper respiratory inflammatory diseases are almost always associated with PET ; half of these patients report previous history of nasal or sinus surgery. Radical posterior / inferior turbinectomies seem to be proportionally connected to PET severity. History of recurrent otitis media with effusion, with tympanostomy and adenoidectomy during childhood is also frequent. Laryngopharyngeal reflux (LPR) is identified in a great proportion of patients. Last epidemiological data indicates that PET results from obstructive ET dysfunction evolving over a long period of time. Since the surgical management of these two pathologies is at diametrically opposed extremes, it is critical to obtain the correct diagnosis before undertaking any treatment. Visualization of a permanently open tubal valve by endoscopic examination allows settling this question, but its absence does not exclude PET diagnosis. Sonotubometry and recently developed tubomanometry may help in some specific cases. Unfortunately, some PET cases remain diffucult to diagnose. Autophonia (self hearing from inside, strongly amplified) seems to be a common symptom to all PET patients. Unfortunately, its presence also reveals an advanced degree of patency, requiring in most cases surgical management. Other symptoms of PET, such as tinnitus, fullness and ear blokage, can also be reported by patients suffering from obstructive ET dysfunction. This differential diagnosis problem leads unfortunately to some surgeries proposed by well intentioned but inexperienced ENT surgeons. Some of these surgeries make things worse. At the beginning, patients hear their own voice “from inside”, amplified and unpleasant. Patients avoid to speak and retire in a rising solitude. They enjoy lying with the head down (it increases venous blood pressure and congestion of the mucosa). With time, appears the respiratory autophonia. At this stage, they hear “from inside” also their respiration. It starts to be unbearable. They may develop a true depression with sometimes suicide feelings. A psychological supervision should be systematic.